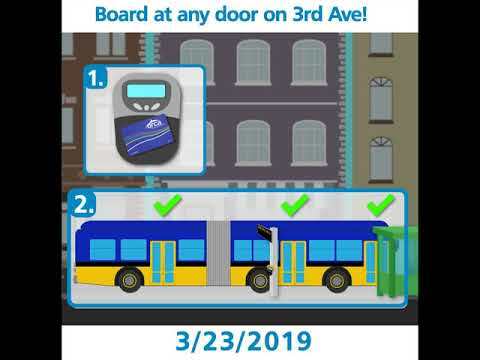 King County Metro passengers will be able to board all doors on all buses on Third Avenue in downtown Seattle starting March 23, making boardings faster and more efficient in busiest transit corridor in the country. The change will go into effect the same day that Metro will increase the amount of service it provides and all bus routes transition out of the Downtown Seattle Transit Tunnel and onto surface streets. The transition will make way for the eventual increase in Sound Transit Link light rail service. The City of Seattle will help commuters by creating a new transit pathway on Fifth and Sixth avenues during evening commutes. Seattle Department of Transportation is upgrading traffic signals to increase efficiency in the downtown corridor. Passengers will be able to tap their ORCA card at fare readers prior to boarding, accelerating boarding times and shortening the amount of time buses wait at each stop by an estimated 20 percent. The greater efficiency will enable Metro to add 30 more trips per hour in a corridor that 50,000 passengers board each weekday. Permanent fare readers already are installed at 21 of the corridor’s 31 bus stops. Metro will install the remaining 10 fare readers starting this spring and finish by the end of the year. In the meantime, two boarding assistants will be positioned at each of the 10 stops to scan passengers’ ORCA cards using handheld fare readers during weekday afternoon commutes, from about 3:30 to 6:30 p.m.
Metro operates 42 routes on Third Avenue that carry about 180,000 passengers each weekday. About 50,000 of those passengers board buses on Third Avenue. Similar to RapidRide routes, passengers must be able to show their recently tapped ORCA card or a transfer slip as proof of purchase after boarding on Third Avenue. The City of Seattle will help commuters by creating new bus-only lanes all day on Fifth Avenue and during evening commutes on Sixth Avenue, from Cherry Street to Olive Way adding to the existing transit-only lane that begins on Fifth Avenue South at South Jackson Street. The new pathway will increase reliability, travel speed, and capacity for Metro buses during peak commutes. Seattle Department of Transportation is also improving traffic signals on Second and Fourth avenues to help buses move more quickly through downtown and improve safety for pedestrians. The Downtown Seattle Transit Tunnel is the only tunnel in the United States that offers both rail and bus service. Having only trains operate in the tunnel will increase Link service reliability. Sound Transit will increase Link light rail service in the tunnel in the coming years as it creates a 116-mile regional system. Sound Transit will open 22 new Link light rail stations in King County by 2024, including Northgate in 2021 and Eastlink in 2023. Under the direction of Executive Constantine – who is also a member of the Sound Transit Board of Directors – King County Metro and Sound Transit have improved the integration of bus and rail service to create a seamless regional transit system. King County Metro will increase the amount of bus service it provides for the ninth time since 2015. It will add service to some of the most popular routes, including Route 120 to Delridge, White Center, and Burien as it ramps up to become the RapidRide H Line in the coming years. The City of Seattle is funding 11 additional daily trips on Route 40 to keep up with growing demand for service that connects North Seattle to South Lake Union and downtown. Metro is also adding service to Routes 50, 102, 106, and 204. All-door boardings on Third Avenue will speed travel times, and help riders make the adjustment from the transit tunnel to the street. 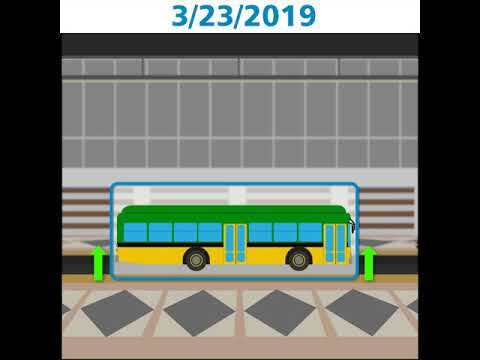 Without having to share space with buses, Link light rail will be more reliable, and in a few years, connect the Eastside with north and south King County. As the region grows and we offer more services and transportation options, Metro and our partners the City of Seattle and Sound Transit are committed to maintaining mobility through downtown, and beyond. As we navigate the first year of the Seattle Squeeze together, we’re continuing to work with our partners and do our part to keep people, goods, and transit moving in and around Seattle. We’re taking steps like adding new bus-only lanes on 5th and 6th Avenues, and partnering with Metro to add more transit service. During this second chapter of the Seattle Squeeze, we need the public’s help to continue to make room on our roads and on transit. During the three-week closure of SR 99, we know that people changed their habits and helped us get through a historic challenge together. Now, we need to keep the momentum going. As we literally build a better city, it will all be worth it. The long-planned transition of buses out of the tunnel will make room for coming light rail expansions that allow many thousands more riders to glide past gridlock. To prepare, we were pleased to work closely with Metro and the City of Seattle on $30 million in improvements to keep traffic moving.